Farm News | Almost Heaven Horse Source | Real Horses… Real People… Radical Results! Go check it out! Work in progress, stay tuned! The Canadian geese in the distance honk to the setting sun. The national parks are the American public agreeing, knowingly or not, to put stewardship in the hands of scientists, naturalists and elected officials. But the land I’m on now, where the geese finally quiet and the beaver swims up to stare at me fully in the face before satisfying his curiosity: this is private land. They have taken ownership to new levels. They care for it after their death, it’s tiny compared to the vastness our public spaces. But it is more land that is protected. And today, many might argue that it is more safe. We enjoy developing horses potentials and abilities. We know we can’t be every horse’s very own person. We CAN prepare the horse and open doors to find that person! We take our time with the horses we represent. We develop a rigorous foundation in each horse using classical dressage and natural horsemanship, establishing a solid base of trust, confidence, and problem-solving ability. We let their individual temperaments and talents help us guide them towards the specialties in which they’ll thrive. Our horses are friendly, respectful and fun friends on the ground. Under saddle, our horses learn lightness, responsiveness and partnership. The result? An unforgettable ride! Our goal at Almost Heaven Horse Source is to bring horses and riders together in powerful partnership. We all celebrate when the perfect match is found! Congratulations to the following horses and their new owners! This category is dedicated to you! Finding a boarding facility that will provide your horse the same level of care and attention you would provide yourself, if you could, is the dream of every horse owner. For me, finding Kirsten Lee was the answer to that dream. In the years I boarded at Kirsten’s I never once worried about whether my boys were getting the best of care, an immeasurable relief to me. And the icing on the cake was having Kirsten as a riding instructor — her patience and kindness is unparalleled, even with a “permanent beginner” like me! I can’t recommend Kirsten highly enough, whether you’re looking to board your horse, improve your riding skills, or refresh/advance your horse’s abilities. I can say without reservation that you will never regret your decision to board/train/ride with her! For the past 10 years I have had the opportunity to observe Kirsten Lee work with young Pony Clubbers on often unsuitable mounts. Her natural ability to effectively communicate to these aspiring riders is unsurpassed. It’s amazing how quickly positive change happens with just the adjustment of seat and hands and positive reinforcement. These kids come out of the ring happier and excited for their next ride. I’ve become so impressed with Kirsten I now trailer over 6 hours to have her work with me as a rider and the retraining of my mare. In just a few sessions, she has my mare rounding and coming onto the bit in a more balanced carriage-something I thought I would never get. The most obvious difference in Kirsten’s methods from other trainers I’ve worked with is she takes the time to assess and get to know the animal as a “person.” She’s not just applying 1 method for all of her charges. She gets into each of their heads and figures out what will work with this horse in this moment. Then, she takes the capabilities of the rider and brings them together in a way that is just magical. 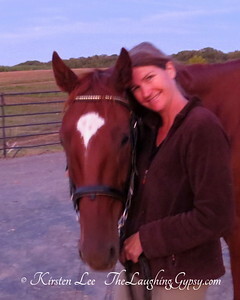 Thank you, Kirsten, for me, my daughters, their horses, and many Pony Clubbers and their mounts! 16+ hand 2007 Pinto Friesian/Percheron. “Spotty” is a striking black and white paint with rare ink spot markings inside the larger white patches. His movement is as eye-catching as his color! He is smart and willing with a hilarious personality. He is an easy keeper and lives out in peacefully in whatever herd we put him in. Spotty has all his groundwork in place. He needs someone with more time than his owner to get him going under saddle and into a successful career!